Both as a commercial production method and a hobby for home DIY enthusiasts, 3D printing has become immensely popular over the last few years. 3D printers can be used to make objects and tools of all sorts on one relatively easy-to-use device, a fact which makes them very useful. At the same time, however, there are some hidden dangers of 3D printing that not everyone who uses the technology is aware of. Specifically, 3D printers give off fumes that may be harmful to human health if allowed to build up to high concentrations. Here’s what you need to know about using air purifiers for 3D printing to keep yourself safe, whether you’re a hobbyist or a professional. Why Do 3D Printers Emit Fumes? 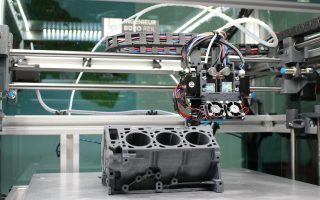 There are many different types of 3D printers, but two of the most common types, FDM and SLS printers, both rely on heating of material to produce prints. FDM, or fused deposition modeling, uses a heated nozzle to deposit layers of plastic filament and build up a 3D object. SLS, or selective laser sintering, makes use of a highly-focused laser to fuse together layers of deposited materials that have been combined with a binder. In both cases, the heating of materials can give off fumes. What Are Some of the Best Air Purifiers for 3D Printing? The best way to get rid of the fumes that are given off in the 3D printing process is to use an air purifier to capture them. Because the fumes are gaseous in nature, a carbon-based filtration system is usually the most effective option. If you’re using a commercial 3D printer that has a direct vent, one of the best options you’ll find is the Amaircare AirWash Eliminator 2X, a commercial air purifier that utilizes both HEPA and carbon filtration to clean contaminated air as thoroughly as possible. This unit is a great solution for 3D printing shops that use SLS printers, as they can usually be vented directly into the unit. If you’re using a home 3D printer, the volume of fumes to which you’ll be exposed is significantly lower. Nevertheless, it’s still important to keep safety in mind and keep fume exposure to a minimum. You can do this by using a less expensive home air purifier that is good at filtering chemical fumes, such as the Airpura P600+ or F600 models, the Amaircare 4000, the IQAir GC Multigas or the EnviroKlenz air purifier. Another good way to protect yourself if you’re a 3D printing hobbyist using an FDM printer is to switch from ABS filament to PLA. ABS is derived from petrochemicals, and as such emits harmful fumes when heated. PLA, by contrast, is a biopolymer made from processed plant fibers. PLA fumes may still have some adverse effects, but there is a broad consensus among 3D printer users that it is considerably safer than ABS. If you have questions about air purifiers for 3D printing shops or other commercial facilities, please feel free to contact us. We’ll be happy to recommend units based on your needs to help keep your workspace as safe and healthy as possible.